In first pAsuram – AzhwAr becomes delighted thinking about the perfect match between the divine body parts and the divine ornaments. In first pAsuram – based on the perfect match between the divine ornaments and divine body parts of lord SrIman nArAyaNan, AzhwAr gets doubts that could not be comprehended by him and hence he asks emperumAn himself to clarify that doubt. malarndhadhuvO – did it rise upwards? alarndhadhuvO – did it spread downwards? kalandhadhuvO – did it spread upwards and downwards? Did the radiance of your divine face rise upwards to become the radiance in your divine crown? Did the radiance of your divine feet spread downwards to become the radiance in the lotus flower where you stand? Did the radiance of your well spread beautiful waist spread downwards and upwards with the naturally radiant cloth and the divine ornaments you wear? Since you are the lord of SrI mahAlakshmi, as said in SrIvishNu purANam 1.8.18 “arthO vishNuriyam vANi” (SrI vishNu is the meaning and SrI mahAlakshmi is the word), as you are the one who are the controller of words and meanings, mercifully explain this to remove my doubts. mudichchOdhiyAy unadhu mugachchOdhi malarndhadhuvO – Did your divine face’s radiance extend up to the divine crown and become splendorous? Or it can also be explained as – did your divine crown’s radiance extend down to the divine face and become splendorous? For a SEshabhUtha (servant), the first thing that will be seen is his SEshithvam (that which highlights the supremacy – i.e., his unique and divine crown); the beauty of the crown that highlights his supremacy leads AzhwAr to his divine feet. adichchOdhi – Did the radiance of the divine feet spread over the lotus seat of your highness and become splendorous? Or did the lotus on which you are standing spread to your radiant divine feet and become splendorous [like a lotus flower would be fresh when in contact with water, your lotus feet are looking fresh due to the contact with the lotus seat]? nI ninRa – emperumAn who is called EkarUpa (unchanging), stood with great attachment like some one performing penance standing in water. Since this the ultimate goal, there is nothing beyond [below]. So, the radiance of the divine feet rises up [leading AzhwAr to other aspects in emperumAn’s divine form]; like a wooden block in an ocean that is pushed from one tide to another, the beauty of different aspects of emperumAn pushes AzhwAr and AzhwAr enjoys them. padichchOdhi – [padi – thirumEni – divine form] Did the beauty of the divine form spread into the many divine ornaments or did the beauty of the many ornaments spread into the divine form? Did the radiance of the divine clothes spread into the divine waist or did the radiance of the divine waist spread into the divine clothes? nin paim pon kadichchOdhi padichchOdhi Adaiyodum pal kalanAyk koNdu kalandhadhuvO – Did the radiance of your beautiful gold-like waist spread into the naturally radiant divine clothes and other divine ornaments? Like we cannot differentiate when water gets mixed with water, it is impossible to differentiate between the radiance/beauty of these various aspects. Alternatively, padi is also explained as “inherent quality” [i.e., all of these aspects are natural for emperumAn]. 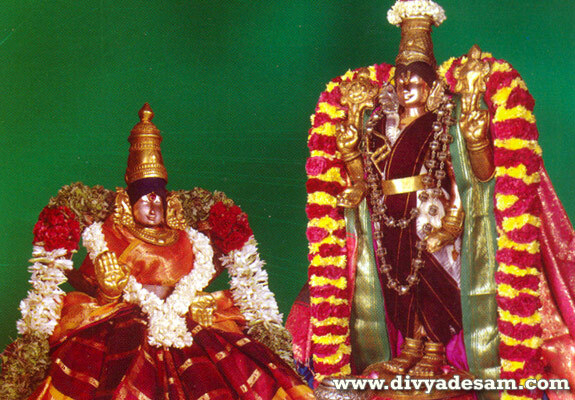 thirumAlE – This divine togetherness of SrI mahAlakshmi and SrIman nArAyaNan is also another beautiful aspect. Both SrI mahAlakshmi who says as in thiruvAimozhi 6.10.10 “agalagillEn” (will never separate from him) and naturally all-knowing yourself should analyse these and give clarification to me. AzhwAr who started enjoying bhagavAn recently [i.e., new to bhagavath vishayam] would say as in thiruvAimozhi 1.1.6 “enRum Oriyalvinar ena ninaivu ariyavar” (emperumAn cannot be understood as having such and such qualities). Those who enjoy him eternally (his divine consorts) would say as in periya thirumozhi 8.1.9 “paNdivaraik kaNdaRivadhu evvUril yAm” (where did we see him before?). emperumAn himself who is naturally omniscient as explained in thiruvAimozhi 8.4.6 “thanakkum than thanmai aRivariyAn” (he himself does not fully know his glories). Thus, these doubts remain for AzhwAr who started experiencing bhagavAn recently, as they do for those who eternally experience him and he himself – without any difference. AzhwAr is thinking that just like he is having these doubts, they would also be having such doubts. This entry was posted in thiruvAimozhi, thiruvAimozhi 3rd centum on July 6, 2016 by Sarathy Thothathri.